The future of the United Nations is more uncertain now than at any time before. Like his predecessors, UN Secretary-General António Guterres has promised to reform the United Nations. The drivers are two major agreements: the 2030 Agenda for Sustainable Development and the Paris Climate Accord. Both stand for a move away from statal, top-down multilateralism and toward a new form of partnership between the public and private sectors as well as civil society. But how can these new partnerships for the Global Goals look like? 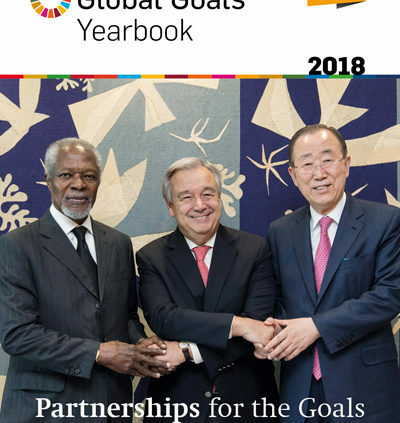 This is the main topic of the Global Goals Yearbook 2018, published under the auspices of the macondo foundation. Our world is truly not sustainable at this time. To make the 2030 Agenda for Sustainable Development a success story, we need an enormous increase in effort. This cannot happen without help from the private sector. But businesses need a reason to contribute as well as attractive partnerships that are based on win-win constellations. We have no alternative but to rethink the role that public–private partnerships can play in this effort. That is why United Nations Secretary-General António Guterres is calling upon UN entities to strengthen and better align their private-sector engagement. In every change there is a new chance. The Global Goals Yearbook 2018 discusses the many aspects of how private-sector engagement can be improved. Recommendations are, among other things, to revise multilateralism, partnership models, and processes as well as to invest more in trust, a failure culture, as well as metrics and monitoring. When businesses engage in partnerships for the Goals, this is more than just signing checks. It means inserting the “do good” imperative of the Sustainable Development Goals (SDGs) into corporate culture, business cases, innovation cycles, investor relationships, and, of course, the daily management processes and (extra-)financial reporting. The Yearbook includes arguments from academic and business experts, the World Bank, and the Club of Rome, as well as UN entities, among them UNDP, UNSSC, UNOPS, UN JIU, and UN DESA. A core question concerns financing partnerships. Sustainable development requires sustainable financing. UN sources estimate the need for financing the SDGs to be from $4 to 4.5 trillion annually. Current annual investments total about $1.5 trillion. So we are talking about an annual investment gap of $2.5 to $3 trillion. To close this gap, financing from private sources is needed, including from capital markets, institutional investors, and businesses. With private-sector engagement, not only does a new player enter the arena, but also new rules are being applied: “Financing” is a fundamentally different concept than the traditional idea of “funding.” It connects the “return on investment” concept with the SDGs. The question is: How do we combine social benefits with profit? Corresponding to the idea of learning from role models, the Global Goals Yearbook 2018 includes 39 good practices of corporate participants that showcase different approaches to the implementation of the SDGs. Verschlankte Navigation und eine frische Optik: So präsentiert sich seit Anfang Mai der neue Webauftritt von UmweltDialog. 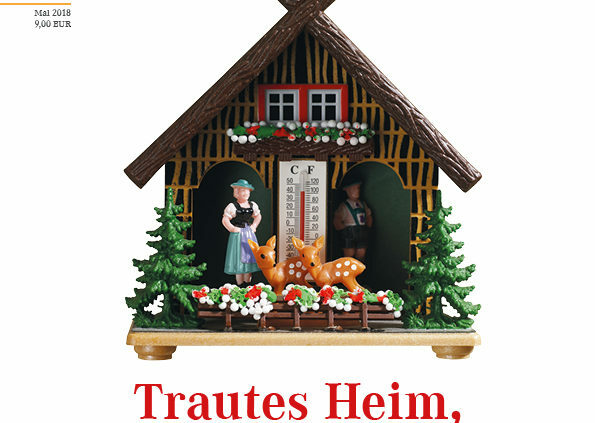 Das Design räumt Bildern und Schriften mehr Platz ein und steigert dadurch die Leserfreundlichkeit der Inhalte. Ein weiterer Pluspunkt: Wichtige, aktuelle Veranstaltungen aus den Bereichen Nachhaltigkeit und CSR finden die User gleich auf der Startseite des Nachrichtendienstes. Welche Herausforderungen erwarten uns? Und welche Rolle spielen die nachhaltigen Entwicklungsziele (SDGs) bei deren Bewältigung? 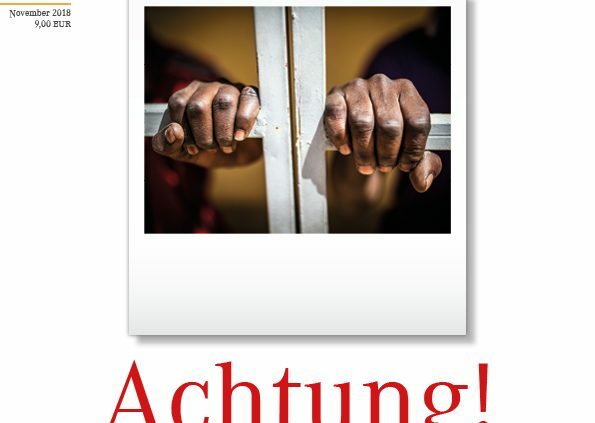 Diesen Fragen geht das jetzt bei macondo publishing erschienene Jahrbuch „Global Compact Deutschland 2017“ nach. Die Publikation stellt mögliche Zukunftsszenarien vor und lässt zentrale Akteure aus Wirtschaft, Politik, Forschung und Zivilgesellschaft zu Wort kommen. 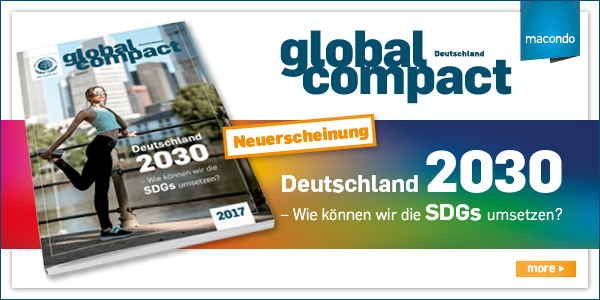 Darüber hinaus zeigen 29 deutsche Global Compact-Mitgliedsunternehmen in ihren Good Practice-Beispielen, mit welchen Maßnahmen sie dazu beitragen, die SDGs umzusetzen. http://www.macondo.de/wp-content/uploads/2018/01/GCD2017_Banner.jpg 300 600 macondo87 http://www.macondo.de/wp-content/uploads/2016/02/macondo-logo.png macondo872018-01-16 11:03:182018-01-18 09:59:12Deutschland 2030 – Wie können wir die SDGs umsetzen?